Yesterday we went to a huge flea market not too far from our home. 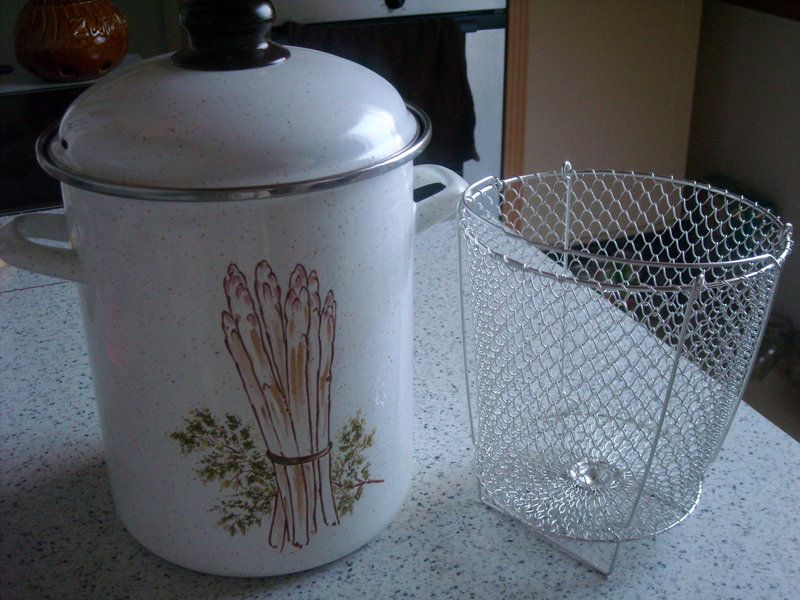 To my great joy, I managed to find a fabulous Spargeltopf (asparagus pot) for only 3 euro. Well, after acquiring such a wonderful item (I’d never even heard of them before), how could I not try it out straight away? 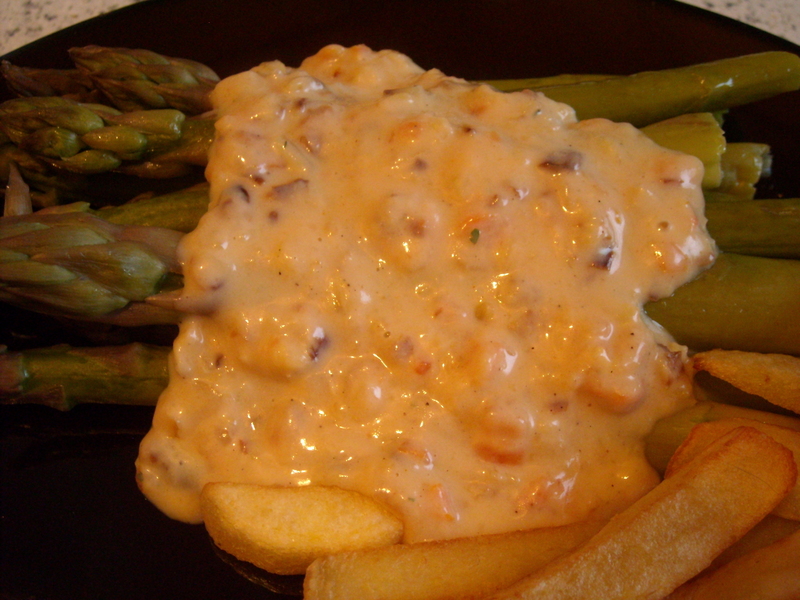 Hollandaise Sauce is to asparagus what chocolate is to Easter. Seemingly, without the one, the other doesn’t seem to be ‘proper’, many people would probably agree. But, I don’t know. There’s something about doing things just because everyone else does them that gets to me sometimes. I love asparagus. Why should I have use Hollandaise as a default sauce, just because? Last night, I decided to be a little rebellious. Well, not too rebellious. But just enough to prove a point – there are other sauces out there that can complement Spargel (as it’s known here in Germany) just as well as the traditional choice. INGREDIENTS – 2 oz. 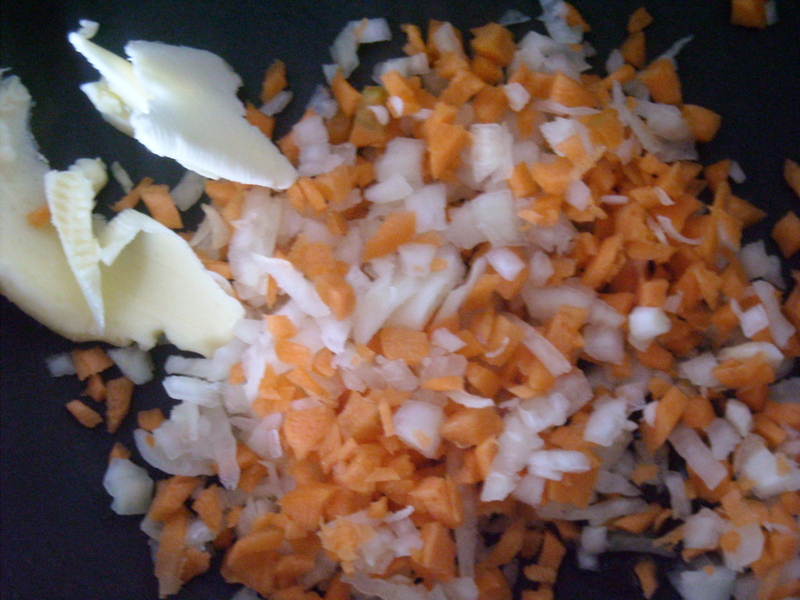 of butter, 2 small onions, 1 carrot, 1/2 a small teacupful of flour, 1 pint of new milk, salt and cayenne to taste. This is Mrs Beeton’s recipe for White Sauce (a meat-free version). I figured, it’s still a light-hued, seemingly mild sauce, so it wouldn’t be likely to spoil the taste of the asparagus in any way. 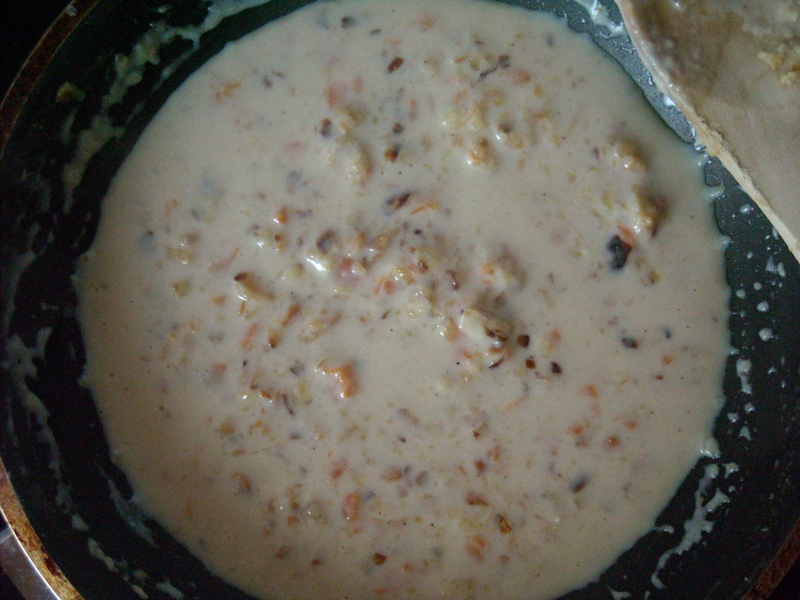 This White Sauce is very easy to make. 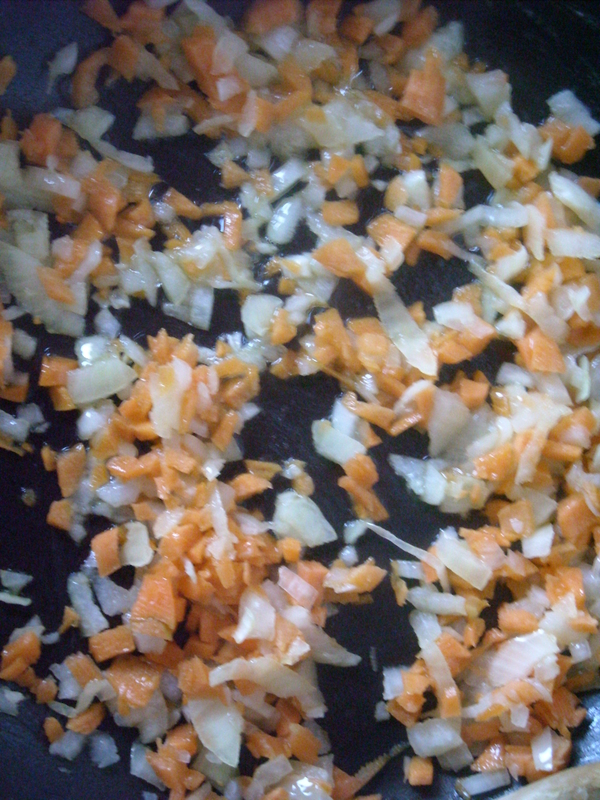 Mrs Beeton instructs that the carrot and onion should be chopped “very small”, but I wasn’t exactly sure what ”very small” meant to her in this context. So I cut them as finely as I could before adding them to the pan. By the time the sauce was finished (less than 15 minutes, it didn’t take too long to prepare as the recipe has a simple list of ingredients and only a few process steps), and I’d briefly attacked it with a potato masher (the quantity I prepared was too small for a blender), the vegetable content was much finer than to begin with. Although, for visual effect, it could have been even finer, but oh well. Both my boyfriend and I liked it. “It seems very nice,” he commented. (Asparagus is not his favourite vegetable, although he’ll eat it when it’s put in front of him. “I can’t see why you’re crazy about it. And I don’t like the smell in the bathroom when you feed me this stuff!”). It is, as I predicted, a very mild sauce – not quite bland, but getting there. It works well with asparagus and is much simpler to prepare than Hollandaise. This entry was posted on April 25, 2010 at 9:26 am and is filed under food. You can follow any responses to this entry through the RSS 2.0 feed. You can leave a response, or trackback from your own site.